Gabriel Sundy honks his horn at Dizzy's Thursday night. Sometimes considered the “blue-collar” saxophone for its supporting role as the Great Punctuation Mark in much of pop music, the baritone sax actually has range enough to go from soothing cello to car horn. A baritone sax can whipsaw a listener à la the athletic funk-rasp of Leo P. in Too Many Zooz, or squeal out bottom-reaching octaves that jump a song with comic undertones like Steve Berlin does in Los Lobos. Doc Kupka uses his famous bari sax as a call to action in Tower of Power, but then, there are also those bari saxists who have elevated the big horn to soloist status. Ronnie Cuber comes to mind. There are critics who even go so far as to say that the late Gerry Mulligan was right up there with bebop alto sax legend Charlie Parker but never got the same adulation during his lifetime because he played a bari sax. Thursday, February 18, 2016, 7:30 p.m. to 10 p.m. Enter hometown bari sax man Gabriel Sundy. He gave me a copy of his Applebrown Jazz Ensemble CD a couple of years ago, and I was taken by Sundy’s range and ability to overcome the myriad restrictions of the instrument. 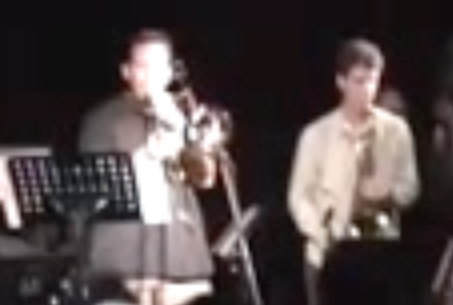 I’m not sure there is a more inventive bari sax man in So Cal — yes, that good. Sundy’s range includes a violent percussive attack and split harmonics and overtones to rival anything made in the Australian outback to keen, soaring jazz lines that must have taken years of monk-like solitude in the practice room to perfect, given the sheer magnitude of the horn and all of its goofball logistics. The one thing Sundy does not do is strand a listener with erratic displays of horn nonsense. Rather, he is a keen student of melody and harmony as well. And in that way, when Sundy plays, he tells little jazz saxophone stories. By the end of a day, that’s where the true craftsmanship of bari sax lies, by using the beast to interconnect with an audience.